Hi! I’m Jennie from Little Girl Designs! Have you ever worked with air-dry clay before? I was concerned there would be a steep learning curve since the last time I worked with clay was in elementary school (unless making pancakes and snowmen out of play dough count.) But my fears were completely unjustified. For those of you who are cooks out there, if you can roll out a batch of sugar cookie dough and cut out shapes, you already have the skills you need to create your own clay masterpieces. 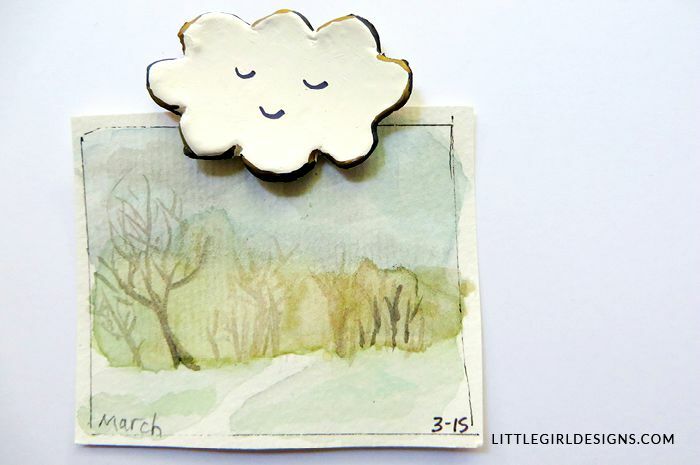 For this project, I decided to make some whimsical magnets for the refrigerator. You can make your own set in a weekend. To begin, I took a ball of clay from the tub and rolled it out onto wax paper. Since I was making magnets that were between 1-2 inches across, I only needed a small amount of clay. I rolled out the clay to about 1/4 inch thick, and cut out the heart shapes with a cookie cutter. You might be able to see with the hearts that one was a bit thicker than the other. That’s fine; they don’t have to be identical. After I cut the hearts, I used my plastic knife to cut out a cloud. This was a little more difficult as the clay is a little bit sticky. You could also cut out an oval shape, and draw the cloud with a pen. Once my shapes were finished, I dipped my finger in water and carefully smoothed the surfaces and edges of the clay. For this project, I allowed the clay to dry for two days. Make sure you follow the manufacturer’s directions on whatever clay you choose to use. If you are using white clay, it will turn from a soft gray to pure white when it is dry. I decided to use colorful Sharpies to add faces to the clouds and hearts. I’ve also used Gelly Roll pens, and they work beautifully as well. For the cloud, I used a gold metallic pen to add some fun highlights. 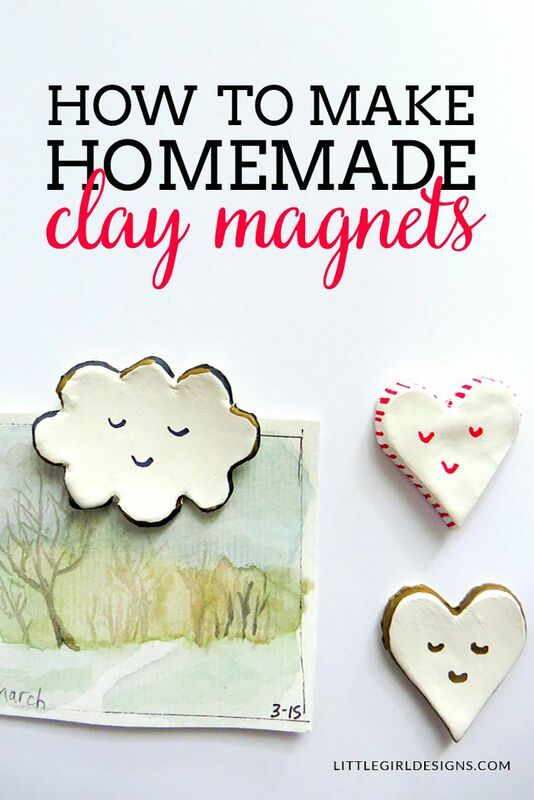 Finally, I turned the clay pieces over and used a hot glue gun to attach a magnet. I did not seal them because I don’t foresee getting these magnets wet, but if you would like to protect your magnets, you can seal them with a varnish. The only problem I’ve found with air-dry clay is it’s addictive. Because I had some clay leftover from this project, I made some extra items and ended up with a collection of beads, buttons, and ornaments. 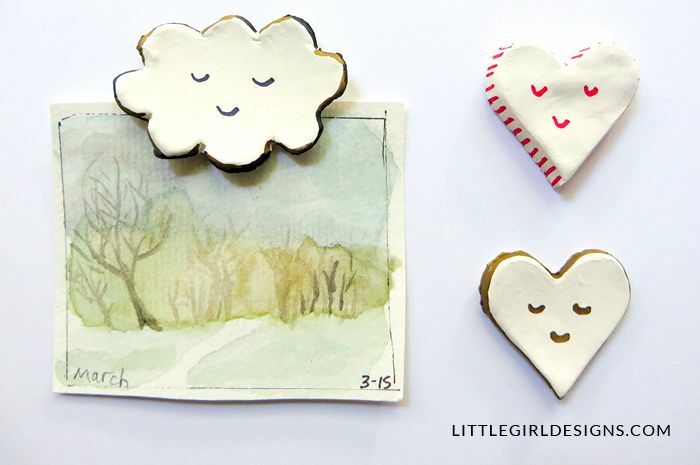 This project is super simple and would make the cutest gift. 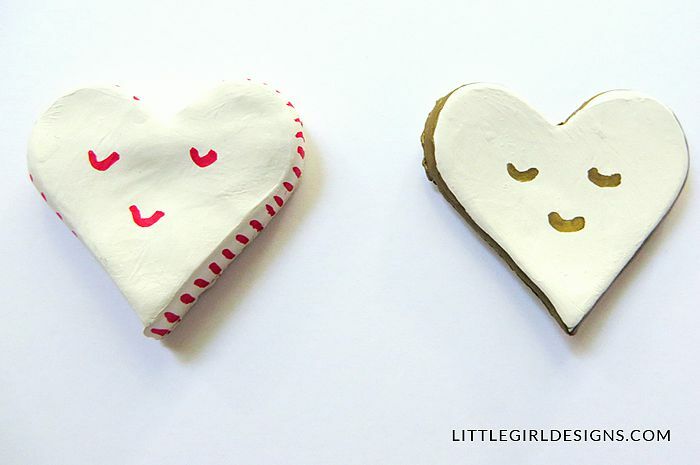 Think about the cookie cutter shapes you have on hand and how you could decorate them. You could also make themed magnets for a friend. Have you ever played with air-dry clay before? What did you make?